Don came home from his business trip a day early this week and yesterday I came home from work to our new apartment filled with the smell of freshly baked cookies. Out comes Don from the kitchen carrying these magnificent chocolate whoopie pies. 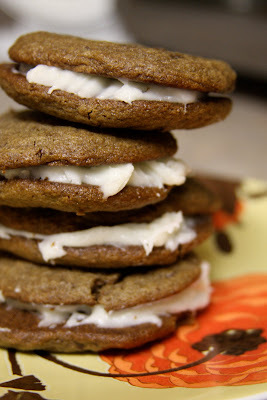 Chocolate cake cookies with chocolate chunks and a layer of creme cheese frosting. Happy weekend to me.